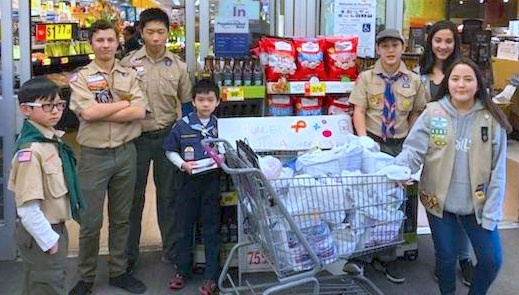 Hats off to the Scouts and Pack 349 of Our Lady of Mercy Church, Forest Hills, for another successful Scouting For Food Drive. The youngsters collected canned food and non-perishable items at the Glendale Stop and Shop for the parish’s food pantry. This being their second year in this project, the scouts expanded their efforts by publicizing in both the parish bulletin and on social media. The Girl Scouts also stepped in to lend a hand. Last year they collected about 3,000 items. This year the scouts were bursting with pride to see two minivans filled with food donations. The final tally came to more than 4,500 items. The Divine Mercy prayer community at Our Lady of the Angelus parish, Rego Park, invites all to its Lenten passion play: At the Foot of the Cross. Be a witness to a live portrayal of the pain, humiliation and suffering of the crucified Christ, our Lord and Redeemer on March 23, 6 p.m. For more information call the rec- tory at 897-4444, Heidi at 917- 626-8926, Rose at 646-617-7401 or Josie at 646-712-2959. The parish also extends an invitation to its Divine Mercy Pilgrimage to the national shrine in Stockbridge, Mass. on Divine Mercy Sunday, April 8. The bus will leave at 6:30 a.m. from the church and will make a rest stop. Bring your own lunch. Tickets are $45, $22.50 for children 48 inch- es and under, and $3 as a tip for the driver. Call Bernie, 718-300- 5927 or the rectory, 897-4444. The African Community of St. Fortunata, New Lots, will also be going to Stockbridge for Divine Mercy Sunday with a departure of 7:30 a.m. Seats are $50 for adults and $30 for children. For reservations call: Gladys at 917-361-7445, Stephen at 347-223-9139, Ngozi at 914-564-7032, Jane at 347-250-5540 or Maria, the parish secretary, at 718-647-2632. St. Joseph’s College, in part- nership with Greenlight Bookstore, is pleased to welcome New Orleans Mayor Mitch Landrieu to launch its spring 2018 Brooklyn Voices Lecture Series. At this event, Landrieu will discuss his new book, “In The Shadow of Statues: A White Southerner Confronts History,” in conversation with author and New Yorker staff writer Jelani Cobb on March 21, 7:30 p.m. in college’s Tuohy Hall Auditorium in Brooklyn. Tickets are $28 and include a copy of the book. Following the discussion, there will be an oppor- tunity to have the book signed by Landrieu. For more information, con- tact Michael Banach at 718-940- 5584 or mbanach@sjcny.edu. Fun And Prayer for St. Saviour H.S. 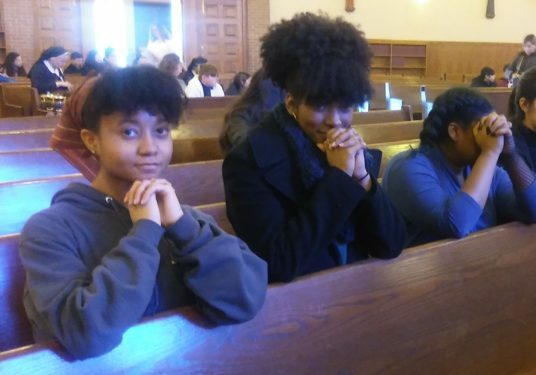 Saviourites attended Catholic Youth Day in Staten Island with other teens, celebrating their faith while singing with the praise and worship band. The young ladies from St. Saviour H.S., Park Slope, also heard stories from a youth minister, a young sister who told her story about her “love” vocation and biker priests. Students particpated in a healing procession with the Eucharist and celebrated Mass with New York Auxiliary Bishop John O’Hara.